At first, Anna Juett would sit down in the middle of practice, or stand back and watch the other kids dance. Now, several years later, she’s front and center in her sparkly costume, more confident in her moves and on stage. “It’s purple and it’s my favorite color and it’s just pretty,” she said proudly about her recital costume. Anna is one of 22 students in a local dance program that holds weekly classes for children and teenagers with disabilities. 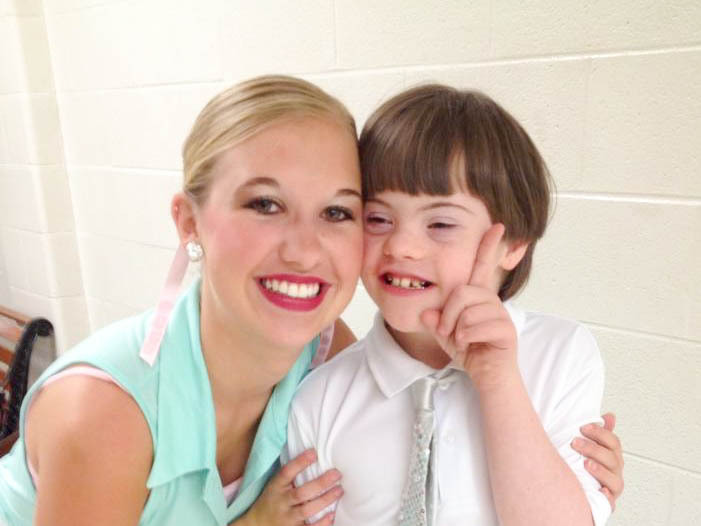 The program, called “A Chance to Dance,” is led by University of Kentucky College of Education student Jenna Lyon. And while it’s true that students are getting a chance to dance and perform, they’re gaining so much more. Lyon is constantly amazed by her students and how they master the routines together, but never surprised. “I think sometimes when kids are labeled with special needs some people just feel like they don’t have the abilities and capabilities that other kids do, but really they just have all the same capabilities and it might just take them a little extra time and practice,” Lyon said. A Chance to Dance group photo. Courtesy of Mark Kidd Studios. She makes a point of teaching the class just as any other dance class — same terminology, type of moves and challenge — but often with a personalized touch, helping students with positioning and even adding in their favorite song or dance move for motivation. That compassion and dedication has had a significant impact on Lucy Harding, who has been a dancer since she was a toddler. She went back to her hometown of Georgetown, Kentucky, and with the help of her parents, school district, a local studio and generous donations, she began her own program while in high school, free of charge. “I wanted to start the program where the families wouldn’t have any expense by doing it because I didn’t want to keep the kids from participating,” Lyon said. The class started with four kids meeting every Sunday night, and it continued for two years until Lyon left for college. When she came to UK, she brought the program with her. Local studio Barbara Ann’s School of Dance opened its doors to Lyon and her students. Now in its third year in Lexington, the class grew from four students to 22 — including those first four — and one class to two. Thankfully, Lyon said, she not only has the support of other dancers and family members helping, but she has also made friends in the UK College of Education who now assist with the classes. After seeing Lyon in the studio with her students, a lot of those friends have asked the elementary education junior, “why aren’t you going into special education?” She’s thought about it, but her goal is to have an open classroom for all children. And while the studio is not quite the same as the classroom, Lyon is already drawing on lessons learned for her teaching career. “You know, never knowing what to expect and going in and having a lesson plan and then just getting into class and completely doing something different based on what the kids are wanting to do and how the class is flowing and everything,” she said. From planning lessons to communicating with parents, she’s taking what she learns in her own College of Education classes to her dance students, and vice versa — an incredibly valuable, real-world experience for an education major. “She’s going to know how to deal with those type students and get them involved and love them and not be afraid and I’m just excited for her,” said Karen Juett, who is Anna Juett’s mom and a special education teacher herself. In her four years of teaching children with disabilities to dance, Lyon said she’s also experienced something else invaluable — friendship.